This works well as I initially focus on terminal performance and then architect the learning for that/those performance competence requirements. 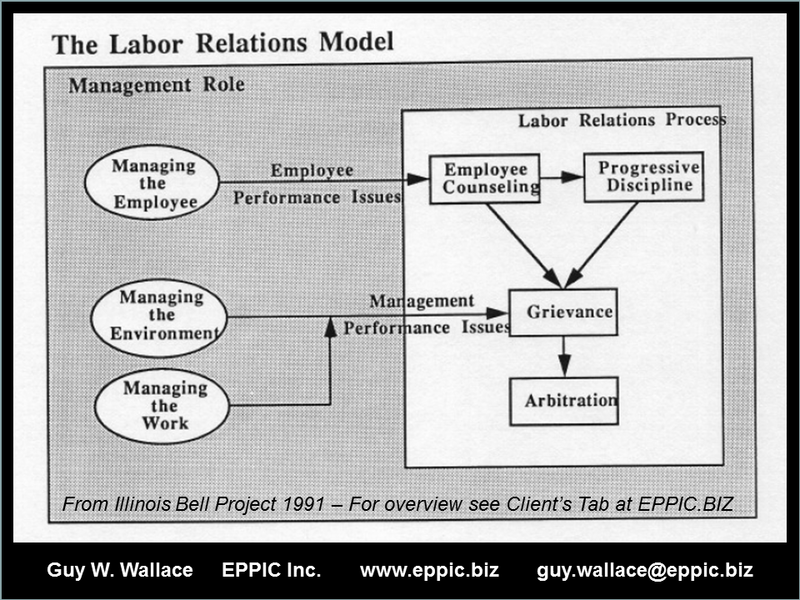 Here is an example from Illinois Bell in 1991 – for all supervisors – addressing Labor Relations. During my analysis efforts I look for the patterns of the process and behaviors and K/S applications – in order to create a “Course Icon” or a “Curriculum Path” icon. Something with enough visual meaning that it creates that mental bookmark. This is the model I created after conducting the analysis. Rather, after I facilitated the Analysis Team in conducting the analysis. We met for 3 days as an Analysis Team – and when they – the Analysis Tea – heard that I was only intending on taking a few of them (read: 3) into the Design Team Meeting, then all rebelled and told me to be prepared for all of them to show up. I had to tell that to the Project Steering Team who were in a bit of disbelief, having thought that we’d be pulling teeth to get a few Analysis Team members back for another 3-day meeting. I proposed a Learning Architecture “flow” and we settled on the following. The important part was having good analysis data and the good insights brought to the table by the Design Team of Master Performers and others. Here is one of many pages from the combo Analysis/Design Document from this project (1991). 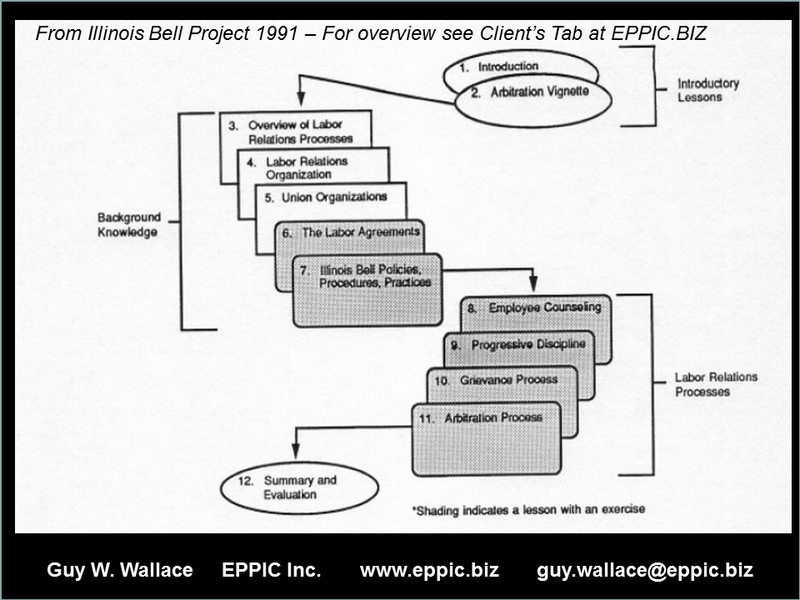 This project was my first formal attempt to Pilot Test my new MCD methodology – the facilitation of both the analysis and the design efforts (that’s the new part) – so that the MCD methodologies reflected the “facilitated Group Process approach” of the CAD methods (in use since 1982). Using Master Performers in the Design Phase – where we facilitated them processing the analysis data – made sure that the Training/Learning Design was appropriate, authentic and led to Performance Capability at some targeted level. No one comes out of training “an expert” – but they are either properly prepared to become one, or not. Expertise is developed over longer stretches of time and effort. Something done all day every day is more easily mastered than performance expected and performed every other Blue Moon. The analysis gave us insight – as a Group – a Design Team – to frame the Lesson – using the Lesson Map configuration. Then it enabled the following detailing of each Box on the Lesson Map. The Lesson Map and Spec – now known as the Lesson Map and the Instructional Activity Specification (Activity Spec) – and have been used on hundreds of design efforts. They are visual tools – some more visual than others – such as the very visual Lesson map and the less-so Activity Spec. It’s all about the Performance – and that leads to “it’s all about” your analysis of performance. How do you analyze the terminal performance requirements? Do you analyze the terminal performance requirements? Or do you just seek answers to questions before launching into Design before Development? I try to establish or represent the context’s key elements in graphics. I see them as an “advanced organizer” for the Learner, if done right, at any point in their climb of the targeted learning curve.